Do you have a problem with mice getting in your camper? Stop keeping all your cheese in it then 🙂 Just kidding, keep your cheese where you please. Just don’t keep any food in your camper that could feed a family of mice for the winter. It’s your home on wheels after all and you don’t want any unwanted guests staying in it without your permission. So, how do you keep mice out of your RV or TT? Old-fashioned snap traps are the go to. Pro-tip: use a piece of Laffy Taffy or chewy candy on the end of it as your bait. They’ll never get their teeth free before the trap snaps. Besides the obvious downsides to cleaning and resetting the traps, the 2nd mouse to find the trap will always get to eat the bait. Poison: Kills the mice, but leaves their dead carcasses in your trailer to rot where it’s hard to find them. It’s not just you that could find them, but your pets could find them too. Not at great solution for keeping the mice out. Put pieces or cut up bars of Irish spring soap around where they might be getting in your camper. This could be around the wheels, jacks, or if your cover comes down to the ground. If stored inside, look for low hanging beams within a few feet of the top of the camper that they could be jumping down from. These little pests hate the smell of Irish Spring soap, so cut up a single bar into 4 smaller pieces. That will create a nice barrier of minty smell. Rule of thumb: 1 bar for every 10 feet of trailer. 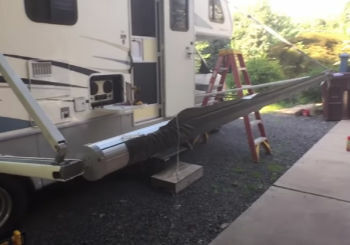 If your RV is 40ft in length, use 4 bars total. Just get a 4pack! Dryer sheets work well too, but the scent does not last nearly as long as a bar of soap does. I’ll put them in the exhaust of my motorcycle though, just to be safe. I keep the bike stored in the camper in the winter for extra room and don’t like it smelling like moth balls or peppermint when I take it out in the spring. Rope lights under the rig are a great rodent deterrent if you are staying in your RV full-time. Mice and other rodents do not like to move around in areas that are well lit. They prefer the cover of darkness, and if you are not letting them hide in the dark then you greatly reduce the desire to hide in your camper. The major drawback to using non-lethal detergents is that they will find somewhere else to go and hide, like in your house, vehicles, or your neighbors place. How do you know if you have an infestation problem already? Mouse Turds – You’ll notice these in darker areas like under the kitchen sink or in closets first, and then they will start crapping all over. Nests – In small areas, if you have paper products or anything that is chewable, mice will start making nests out of it. Chewed Food Containers- They can smell the food in there, and will try to gnaw their way into anything plastic or sealed. Holes – Entry and exit holes will appear were they got in and are moving around in and out of. Smells – Rat and mice urine and droppings have a distinct sour smell that you won’t be able to miss. Kind of like leaving a 1/2gallon of milk on the counter for 2 weeks in the texas summer. Sounds – Little feet scarring around or chewing on wood are audible. If you travel full time and do not store your rig for the winter, you’ll be able to hear them when you are just getting too sleep. Insulation – Making nest out your RV’s insulation can cost a bunch to replace. You’ll need to remove panels and re-seal up damage areas that have the insulation chewed out. Upholstery – Your chairs, couches, and bed make great material for mice and rats to nest in too, and they will chew it up to do so. Plastic/Rubber Tubes – Your water lines and other hoses can be damaged too. Not only will the line need to be replaced, but also any water damage that may be caused when one falls. Smells and Stains – Droppings and urine will stain anything it touches and will need to be cleaned or replaced. 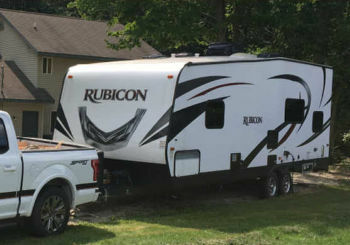 The costs to fix these damages can quickly add up into the thousands of dollars plus the time it takes you to have it repaired that you could be out enjoying in a campsite. And the mess, don’t get me started on the mess to clean up! Mice, rats, and pests also carry parasites and disease. Not noticing and cleaning up any of the above contaminated areas puts you, your kids, and your pets at risk of diseases carried by rodents.